Kanaloa at Kona 1002 provides the perfect blend of luxury and value in an unsurpassed Hawaiian setting. This large (1500+ sq.ft.) and elegant condo is situated on the north edge of the Kanaloa complex, facing the Kona Country Club course about 100 yards off the ocean. It's an ideal setting for fun family vacations or tranquil getaways. We've just completed master bathroom renovation, plus recent kitchen and living room upgrades. It's looking better than ever! The historic Kanaloa at Kona resort is famous for its gorgeous tropical landscaping and peaceful ambiance. Kanaloa features three swimming pool and spa complexes and lighted tennis courts. The location is close to downtown Kona but away from the crowded 'condo row' along Ali'i Drive. There are lots of nice places you can walk right from the front door. Escape the traffic! Our unit is beautifully decorated and furnished, with a king bed in the master suite and two twin beds (or king conversion) in the second bedroom, plus two sofa beds. Very complete kitchen, TV/DVD/VCR, second TV in master bedroom, washer/dryer, and many extras. Fast wifi throughout. The large, shady lanai is surrounded by greenery, with lovely golf course and mountain views. Please see the slideshow on our owner's website and our Kona condo pictures here on VRBO. Please contact Scott or Jen and let us help you plan your trip to the Big Island. Mahalo! The Norris family has been traveling to Hawaii for years. 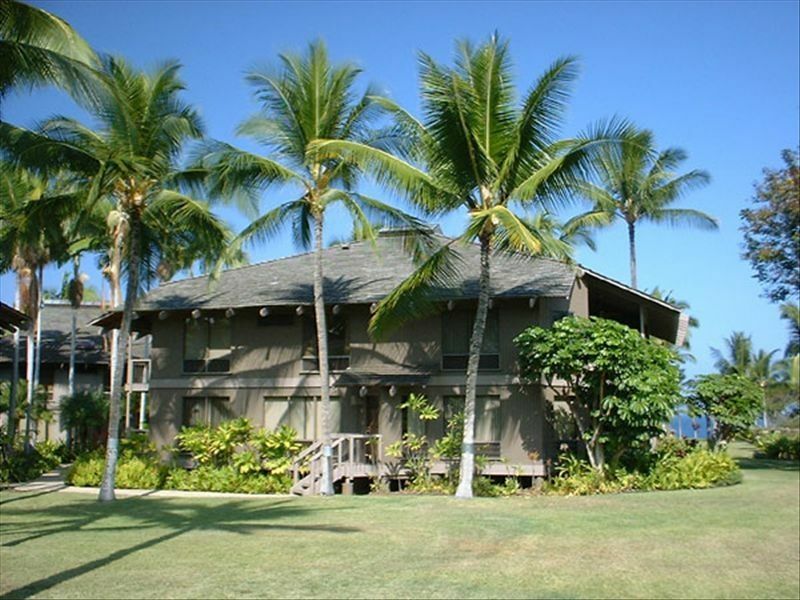 We have listed this great Kanaloa at Kona condo on VRBO since we purchased it in 2001. We have stayed at many places in Kona and we looked at everything on the market. Kanaloa at Kona simply stood out from the rest, and as soon as we saw this unit the decision was easy. For overall size and quality, plus the great location and expansive setting, Kanaloa is tops. For us one of the big things is traffic--or lack of it, when staying at Kanaloa. We have rented ocean view units at the Bali Kai and others where you get a nice view--from the living room. But in 2BR units the second bedroom may be facing the street! Step outside in those places and there's nowhere to walk or run except up and down the bike lane on Ali'i Drive. So we love Kanaloa where you can step outside and walk barefoot on lawns down to the shoreline, or stroll along the oceanfront or over to the nearby marina. Remodeled master bath in 2018.